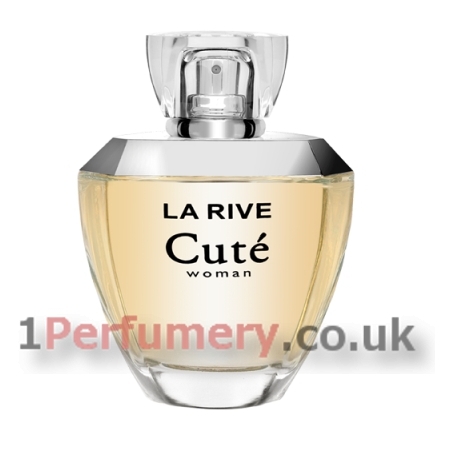 La Rive Cute is a Floral fragrance for women. This is a feminine and romantic perfume with an intensive floral aroma; the fragrance with character. Mixture of honeysuckle, orangle blossom, ylang-ylang, hyacinth, lilac, coconut, bergamot, aldeydes and juicy peach is at the top notes. The heart ticks in the rhythm of elegant jasmine, rose, narcissus, tuberose and carnation along with the oriss root, and the base adds up with oakmoss, sandalwood, amber, musk, cedar and benzoin. - Base Notes: oakmoss, sandalwood, amber, musk, cedar and benzoin.